Sample the best BBQ in town from celebrity chefs like Myron Mixon, Moe Cason, and Jamie Purviance. The following content is created in consultation with Giant Food. It does not reflect the work or opinions of NBC Washington’s editorial staff. To learn more about Giant Food, visit Giantfood.com. Craving a weekend filled with endless barbecue prepared by some of the country’s greatest chefs? 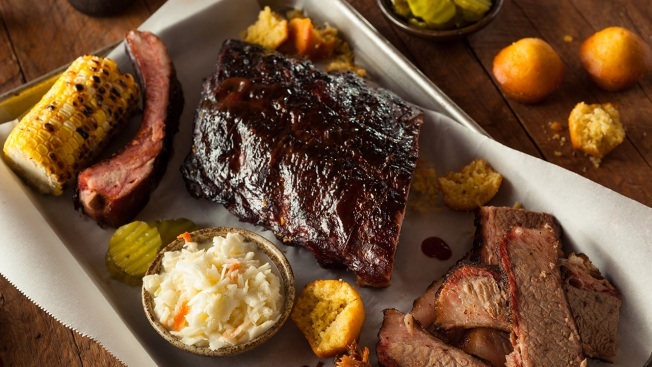 How about sampling the best brisket, ribs and more all set to the tune of 30 live bands? And what if we told you that all this indulgence was for a good cause? Well, friends, prepare yourselves, because it’s time to celebrate the 25th Annual Giant National Capital Barbecue Battle. Giant Food is once again the title sponsor of this spectacular DC tradition, benefitting the USO and the Capital Area Food Bank. With 42-locations in the D.C. area, Giant Food is thrilled to bring you this delicious, fun, feel good experience that’s the perfect opportunity to be a socially responsible consumer. BBQ teams from around the country will compete this year for the title of America’s National Barbecue Champion, from celebrity chefs like TV’s “BBQ Pit Master Show”’ Tuffy Stone to local mom-and-pop teams. This delicious competition is accompanied by live performances of Rock, Reggae, Jazz, Blues, R&B, and Go-Go by over 30 bands. Try all kinds of free food samples and wash it all down by visiting the various beverage tents, like the Heineken Beverage Gardens. One of the best things about the festival is the full schedule of cooking demonstrations by celebrity chefs like BBQ legend, Myron Mixon, TLC’s “BBQ Pittmasters” and “BBQ Pit Wars”’ Moe Cason, and New York Times best selling cookbook author, Chef Jamie Purviance. The event will also feature several special attractions including Warner Bros. Pictures “Dunkirk” Prologue Experience, The Oscar Mayer WienerMobile, Nathan’s Famous Hot Dog Eating Contest, and more. Plus you’ll be enjoying it all in support of the USO. This year’s GiantNational Capital Barbecue Battle benefits both the USO-Metro and the Capital Area Food Bank. That means your money and time will be well spent. The United Service Organization (USO) is dedicated to supporting US military members and their families. The USO provides programs, services, and live entertainment to members of the military and their families, tirelessly working to keep service members connected to their families, homes, and this country. The Capital Area Food Bank is the Washington Metro Area’s largest organization working to alleviate hunger and its related issues, like under-nutrition, heart disease, and obesity. CAFB delivers food to hard-to-reach areas and helps over half a million people obtain access to healthy food every year. With such an exciting event supporting these two excellent causes, your weekend is a guaranteed good time. Get your tickets here and arrive hungry. Where: Pennsylvania Avenue and Constitution Ave, NW between 3rd and 7th Streets. Who: BBQ teams from around the country. Celebrity chef appearances and demonstrations. Live performers. Why: To determine America’s National Barbecue Champion all while supporting the USO and the Capital Area Food Bank. BBQ Web Spot 2017 from Jimi Lyons on Vimeo.